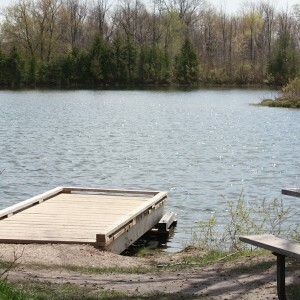 The 217 acre property offers a diverse range of recreational opportunities and is a unique Conservation Area in CVC’s system. As a Resource Management class Conservation Area, Ken Whillans is managed primarily to provide natural resource related benefits such as fish and wildlife opportunities or flood protection initiatives. It also provides recreational opportunities, however protection is still the key mandate. The area sports a view of the Niagara Escarpment’s ‘Devils Pulpit’ area as you travel along the northeast corner of our Harvest Trail. Two ponds offer anglers a chance to catch bass, perch and recently stocked trout. ( NOTE: Bass season opens the fourth Saturday in June). CVC has recommended catch and release policies within these ponds. Old and young alike can enjoy the easy access to these waters while fishing knowledge of older generations can be passed down to their children. Access to the Credit River allows anglers even more opportunity for fishing. The area provides direct access to the popular Caledon Trailway, a rail-trail offering walking, cycling and equestrian use, though no horses are allowed in the Conservation Area off the Caledon Trailway. The Town of Caledon has recently erected a bridge crossing over Highway 10 to facilitate trail use on this part of the trail.